Why are you leaving now, Alan? What will happen to the Meg now... I shall write something more about Lord Barnes in a separate article, but the last 40-odd issues have been a joy and of a very high standard. Whilst the Duke of Barnes and I haven't always seen eye-to-eye (I hope, with counselling and the healing passage of time, I can wipe out memories of The Dredd Files) I have the highest respect for the man. He is am editing legend. Young Middenface is back! Huzzah! Still drawn by Shaun Thomas, whose style I am warming to, and written by Alan Grant as ever, a year has passed since Killoden and Stinkin' Billy has declared all out genocide on the muties. Middenface and his chums have been forced into using guerrilla tactics to strike out against the government and it's forces. The opening episode of a story called A Scottish Sojer see the muties attack what looks like a bakery, but it become clear they weren't after just the cakes... Thomas style is unique. I haven't seen anything like it in any other strip. It oozes atmosphere, darkness and gloom. Anderson has reached part 3 of her current story, Lucid, and we saw some real plot development. This was nicely paced and I think it was the best episode so far, and for quite a while previously. I've been struggling a little with her stories, but this part has reignited my interest. Shimura remains an enigma... Brilliant, brilliant Robbie Morrison story and black and white artwork lacking in detail from Colin MacNeil. I refuse to criticise Colin. The man is a minor deity of comic art, and I can't draw for toffee. It's simply I think he may have rushed it or was asked to draw in a different style or something. There is a lot of white and black space and backgrounds are sparse. His characterisations are lovely, with fluidity in the fight scenes. Perhaps the script didn't help. I dunno. Anyway, the story is great and I'm looking forward to next time. Finally for the original strips, we had a completely new character: Darren Dead. Written by Rob Williams and drawn by John Higgins, this is a prequel to what I anticipate will be a longer story to appear down the line somewhere. I enjoyed it.. It is a variation on the old 'ordinary-ish weirdo meets radiation and turns into something even weirder', but that's fine with me. To summarise, Darren is dead, but he can walk and talk and appears to be pretty much alive. Oh, and he hears dead people. Very 'Sixth Sense'. I hope it returns in a longer format. Charley's War still has the French deserter telling his story. It is interesting, but I still feel it is dragging on somewhat. Still, am enjoying it in the main. Metro Dredd was ok, although the end was a bit silly. 15 Years, Creep: The Megazine story continues to fascinate and hold my attention. Bishop is such a great biographer of comics and he gets access to a lot of the main players. It was also good to find out why Wardog was such a - well - dog! Of course, it helps that Bishop himself was one of the main players. And to his credit, he included the criticisms levelled at him from others, which is a pretty fair-minded thing to do. 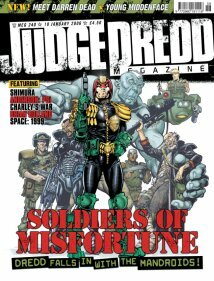 The other text article of note was an interview with the legend that is Brian Bolland. It written like one of those interviews in the Sunday papers where you get the incidental interruptions that happen. Bolland answers his telephone. Bolland sips his tea. Ok.... It doesn't seem to have much of an order to it either. We do go through in a rough chronological order, but it jumps about too. Still, it's an insight into the man and his hatred at losing his artwork to bins or unscrupulous individuals (no names are shamed). Over in Hotshots, Jonathan Morris tells us how much he hates Space 1999 and Scott Gray writes his last Comics slot with a review of Canon - which sounds barking. I'll pause for a moment to thank Scott. I didn't read all his recommendations, but the ones I did were very good. He has a nice writing style too. Meg 241 - Enter The Dragon!